Graphics capability is one of the most important elements besides the processor core power in both PC and mobile market. And in order to continuously stay competitively in this market segment, some ARM licensees and even X86 architecture chip maker has actually licensed the latest graphics technology solution from Imagination Technologies, which is famous for its advanced Powervr SGX GPU (Graphics Processing Unit) to be integrated into its processor core for sophisticated graphics processing. Just recently, TI (Texas Instruments) has taken an initiative to license the latest SGX Series5XT from Imagination Technologies for its next generation OMAP SoC (System on Chip). 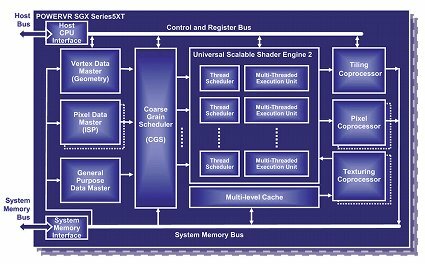 The new SGX Series5XT is claimed to be able to boost from 100MHz to 400MHz, and is capable to deliver impressive performance with up to 35 million polygons per second. Besides, it will be available in multi-core (up to 16-core) and is compatible to almost every OS like Android, Symbian, WinCE, windows XP and even Vista with OpenGL 2.0, OpenVG 1.1 and the new OpenCL 1.0 support. If you remember, both Intel and Apple are eying on its advanced graphics solution and has already invested additional share into this company with the hope to get some influencing power in their future directions. Some of the famous ARM based processors that had been integrated with Powervr graphics IP include the recently announced Apple iPad’s A4 processor, TI’s OMAP series, Marvell’s PXA310/312, Freescale’s i.MX31, Samsung’s S3C2460/S5PC510, Renesas’s SH Mobile series and many more. From X86 architecture core perspective, Intel’s Pentium based CE3100/4100/4130 and 4150 were also having earlier version of Powervr, besides the US15W chipset that used to be paired with first generation Intel Atom Z5XX (codenamed as Silverthorne). Not to be surprise, there are already more than 250 millions of mobile devices in the market that being powered by Powervr graphics technology. No official availability yet, but we should expect more and more ARM licensees as well as Intel to continue acquire its latest graphics technology ready for their next generation SoC suitable for multimedia centric applications.